On the 7th of Muharram, Shz Taher bhaisaheb did zikr of Maulatuna Fatema AS, Fatemi Dawat, and Fatemi Dai. He said that it is a very difficult endeavor to stay on path of haqq. Indeed, Iblees had challenged that he will take control of 999 people out of a thousand. Allah let him be so that his mumineen, through hardships, would become pure. That is the meaning of this life. He further declared that it is truly very sad that there are people who know where haqq is and yet choose to be with the people against haqq, for the Quran says in regards to those people that: ‘You, in that case, would be like them’ (Surat al-Nisaa’: 140). Shz Taher bhaisaheb asserted that Panjetan are the Noor of Allah. Fatemi Imams are the Noor of Allah and Fatemi Duat are the Noor of Allah. Today, that Noor is seen in our beloved Dai-Al-Fatemi, Qutbuddin Maula TUS. For those who stay connected to this Noor, Jannat awaits them eagerly, and when the time comes for that Mumin to go to Jannat, it is said that the Noor of jannat increases. After praying Husain’s shahadat, Taher bhaisahebb narrated with immense emotion the shahadat of Maulatuna Fatema. Taher bhaisab concluded waaz by saying that Fatemi Dawat exists today only because of Husain’s sajda and the 72 that were with him. On the night of 3rd Moharram ul haraam Shehzada Taher bhaisab performed bayan on the meaning of walayat, mohabbat. The mohabbat of panjetan has been made mandatory in the Quraan. The ayat, addressed to Rasulullah, states: Say, that I do not ask anything from you, except that you do mohabbat of my kin. When asked what was meant by kin, Rasulullah said Ali, Fatema, and their progeny. On the day of ghadeer e khum,an Ayat came upon Rasulullah stating that if you do not deliver this risaalat(of walaayat, mohabbat), it will be as if you have not delivered anything else. 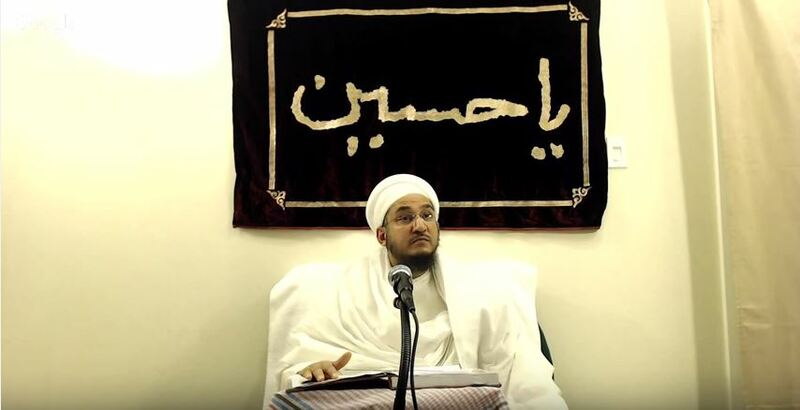 Syedna Qadi Noman explains the meaning of walayat as obedience of the one you love. Along with the walayat of Imam uz zamaan the mohabbat and iqraar of the Dai zamaan is necessary. We thank God that we are the ones who love and believe in our Dai zamaan, Syedna Khuzaima Qutbuddin with conviction, that in the turbulent storms that we are passing through today he is the one who is guiding us in the ship of salvation towards heaven. Shezada Taher bhaisab went on to strengthen our conviction by relating about the difficulties and storms faced by Nooh Nabi during which people kept losing trust in Allah and finally only 80 people remained with Nooh. And only those 80 who remained on سفينة النجاة , the ship of salvation, were saved. Families were lost, Nooh Nabi’s own son was lost. When pleading to Allah for his life, Allah Subhanahu revealed an ayat: انه ليس من اهلك, He is not from your family. Quran also states, that on the day of judgement, no intercessor nor any true friend will come to your rescue. Your actions and your love will be what saves you. These stories in the Quran are meant to serve as a lesson, we should pay heed and realize that the relations of deen are more important than the relations of this world. Rasulullah said my ehle bayt are like the ship of Nooh. Those who accept them will achieve salvation and those who don’t will perish. In Karbala, Husain was the ship of salvation. 72 waves came. It is said that the shohada e karbala, before the sweat had dried on their horses, had already reached jannat. It is not surprising how the people who perished, perished. What is surprising is how the people that achieved salvation, achieved salvation! When Imam is in seclusion, the Duat Mutlaqeen are the ship of salvation. Many enormous waves of fitnat have come, such as the fitnat of Sulayman in Syedna Daud’s time. In Syedna Taher Saifuddin’s time, the enemies of dawat tried to scare Syedna with threats of bloodshed. Syedna, with absolute trust in Allah replied, You hope to scare us with bloodshed? Do you not know that our forefathers have given their lives for the sake of dawat! He explains that when coming aboard the Safeena, come with peace and conviction, regardless of the waves surrounding you and remember Maula Ali’s kalaam that, even after death my conviction will not be any greater. Isa Nabi said, do not fear the one who kills your body, but fear the one who kills your soul. We are all very aware of our recent history when people from within our religion, people of power, tried to destroy so many souls by spreading lies like differentiating rutbas in zahir and batin, when each and everyone of us had promised in our misaq that we will not separate zahir and batin. Let us pray to Allah Subhanahu as Nooh did in the Quran, :”My Lord, do not leave a single inhabitant out of the disbelievers. If you leave them, they will lead your servants astray.” Taher bhaisab said that Allah has made this world a house of hardship for awliyaullah. Husain took this ship towards jannat surrounded by enemies, praying to Allah. Let us also pray to Allah as we are surrounded with difficulties in this world, but are sitting contently and peacefully in the ship of salvation with Husain’s Dai, Syedna Qutbuddin tus, with our trust in Allah. And let us always remember that the Safeena tun najaat is here today only because of that sajda of Husain, in Karbala. Shz. Taher Bhaisaheb performed waaz on the night of 2nd Moharram ul haraam in Silicon Valley, starting in the name of Allah, and asking for yaari from Allah, his Wali Imam uz zamaan and his Dai. He said that we have gathered here in the pursuit of knowledge and to increase our darajaat in heaven. The Quraan states that, “Allah will exalt those who are given knowledge”. In a world in which atheists and their like describe religion as a ‘purposeful suspension of critical thinking’ our prophet Rasulullah made it mandatory to attain knowledge and spend time on critical thought. Shezada Taher bhaisab further stressed the importance of attending waaz with Moulana Ali’s kalaam, that: all things have a peak, the peak of Islam is Shia. All things have a foundation, the foundation of Islam is Shia. All things have honor, the honor of Islam is Shia. And finally, the leader of all majalis is the majlis of Shia. Because of Shia, there is rizq and honor for everyone else. He further states that we have gathered in Husain Imam’s majlis, in which the angels have gathered. They collect the tears of mumineen and treasure them for our life hereafter. He spoke of how Rasulullah created the dawat of tawheed(the belief in the oneness of Allah) in the midst of jahaalat. He erased the darkness of jahaalat with one phrase, لا اله الا الله. There is no god but Allah. Rasulullah said: “He who knows his nafs(soul) knows Allah”. This hadith is interpreted in two ways. One, in which Syedna Muayyad states that human beings know their sense of being. They know that “I exist”. Therefore, there must be someone who created me. The second interpretation is that when humans are not able to understand their own souls(nafs), how can they expect to understand their creator? Moulana Ali said that, to accept the fact that you cannot understand/comprehend God, is understanding God. Tawheed is accepted only with the obedience of haq na saheb. Without obedience there is no tawheed and without tawheed there is no ibadat. We thank Allah that we believe in the true representative of our Imam, Syedna Khuzaima Qutbuddin TUS to guide us towards the understanding of true tawheed. Isa Nabi said that he who does not have two births will not enter into jannat. Misaq is the second birth, given of one’s own will. And the deeni paternal and maternal relationship lasts forever. It is not enough to just believe with one’s heart, saying it out loud in misaaq is essential as per Rasulullah’s hadith. “الايمان عمل كله” Iman is all about action. Taher Bhaisaheb ended the waaz with the shahadat of Imam Husain, and said that it is because of Husain’s shahadat that Kalemat ush shahadat lives on till today, and urged mumineen to get ready by wearing the clothes of mourning to cry- cry on the tragedy that made your prophet cry, cry on the tragedy that made Fatema’s heart cry. And prayed that may we and our children pray لا اله الا الله and stay on the path of Rasulullah’s shariat and may our hearts overflow with the love of his Dai, Qutbuddin Moula tus.